This post contains affiliate links, meaning that if you make a purchase through one of my links I will get a small commission. This is at no extra cost to you. Thank you for supporting Townsend House! I have to admit, this whole self-care thing has been a bit of a struggle this month, but one thing that I seem to be doing better at is knitting! 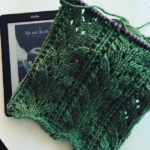 I have been in such a knitting funk for so long, there was never any time, it seemed, where I could knit more than two rows at once. But, the stars have been aligning at least a couple times a week, and I have had some dedicated time to do my knitting. It has been really nice to have the needles going again, especially since I am knitting something for myself, also something that doesn’t happen often! Even with more time to knit, the speed of my actual knitting has not increased, so it doesn’t appear that I have made much progress in the past week on this runner, but I am still enjoying the pattern, and I think it is turning out really nicely. As far as reading goes, last week I got my second official POPSUGAR Must Have subscription box. The POPSUGAR box is a monthly subscription that contains 5-7 lifestyle geared items, and it is a real treat for me. 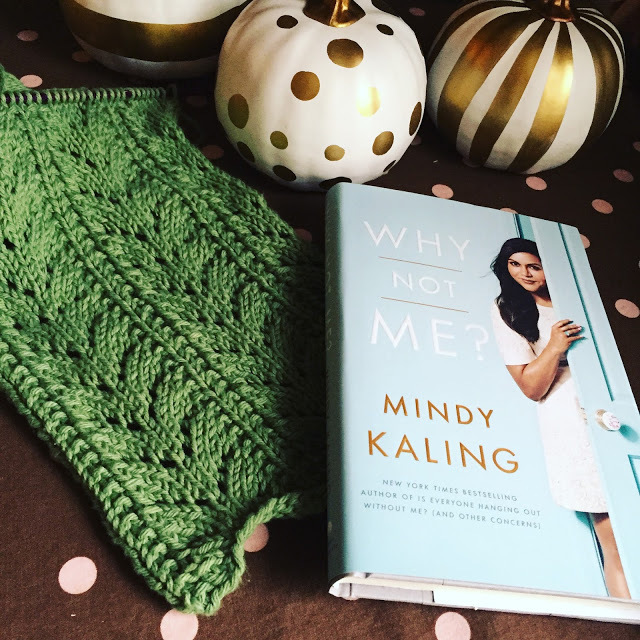 This month, Mindy Kaling’s new book Why Not Me? It is a collection of short stories, so perfect for when I don’t have a huge amount of time to sit and read a novel. I have heard several people say that her audio books are really great to listen to, and so I think I might see if I can get it on audio. If you are interested in seeing the rest of what was included in my October POPSUGAR Must Have box, you can watch the video below. gorgeous green yarn and I love that stitch pattern!! Darling runner! What a pretty pattern. I should look into Mindy kaling, I bet I would enjoy her books. Loved seeing what was in your box. I want to order some sort of surprise box and this is in the running now! Thanks for sharing!